Michael Shea first came to the attention of the world of fantasy literature in 1974, when he wrote A Quest for Simbilis, a novel that began its existence as a pastiche of The Eyes of the Overworld but was actually granted status as an authorized sequel by Jack Vance himself. Though eventually displaced and de-canonized by the appearance of Cugel's Saga, A Quest for Simbilis was nevertheless well received, establishing Shea as a master of description and mood. 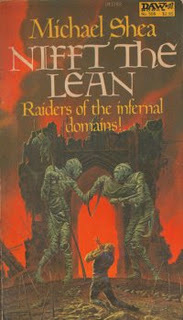 Despite this early success, aside from a few short stories, Shea didn't produce another novel for nearly a decade, until Nifft the Lean appeared in 1982. Nifft the Lean is not set in the Dying Earth, but there's no denying that there are more than a few connections between it and Vance's famous setting. For one, it's setting seems to be a world that may or may not be a future version of the Earth, eons after the fall of our current civilization, after magic, gods, and demons -- or at least seemingly magical, god-like, and demon-like things -- have returned. For another, the book's eponymous protagonist is a ne'er-do-well on the make. Also like The Dying Earth, Nifft the Lean isn't really a novel so much as a collection of four short stories. Granted, each of these short stories features Nifft in another adventure, but each can be read independently of the others and there is no overarching story connecting them. I suppose one could make the argument that the book is really a picaresque novel, especially since Shea presents these short stories as a series of reminiscences by a friend of Nifft, a scholar by the name of Shag Margold. Margold speaks in a pedantic, persnickety fashion as befits his role and reports to the reader that Nifft is dead and thus the stories that follow are his recollections of his friend's adventures, as told to him by Nifft himself and others, which is why they are told in the first person. This admission allows Shea to spin what might very well be tall tales rather than the unalloyed truth, which, given the nature of a couple of the book's integral stories, would explain a lot. Furthermore, Margold stresses that he was not present during any of these adventures and has had to rely solely on others for accounts of what occurred. The first story in the collection concerns Nifft's attempt to bring a living man into the underworld at the behest of the spirit of the lover whom the man has betrayed. In return, Nifft has been promised the key to a wizard's mansion, where untold wealth is said to lie. To win his reward is no easy task. The second story involves a journey into a dangerous swamp in order to harvest black swamp pearls that grow on the bodies of deadly polyps native to the morass. Naturally, Nifft has a plan designed to make acquiring the pearls easier for him. The third story sees Nifft and his companion being falsely arrested and, in order to escape the penalties imposed on them for their "crimes," must rescue son of a rich man, who has been abducted by an inhabitant of the Demon Sea. This story is by far the longest in the book and it shows, dragging on to the point of tedium in places. The fourth and final story involves Nifft in an attempt to save a city from the collapse of a nearby mountain whose foundations have been weakened due to over-mining. Nifft the Lean is an uneven book, but it's still a fairly engaging one. As I noted above, Michael Shea possesses a superb command of description and mood. His characters and, to a lesser extent, his plots are a bit shallow, or at least more straightforward than one might expect of an author whose debut novel was a sequel to The Eyes of the Overworld. Shea is no Vance but I think he can favorably be compared to Clark Ashton Smith, whose best tales achieve their brilliance more by the evocation of a mood than by tight plotting or deep characterization. That's not to say that Nifft the Lean is purely an exercise in mood creation, because all of its integral stories are fairly satisfying pulp tales, despite their flaws. Moreover, Shea has a very vivid imagination: his inhuman monsters and otherworlds are memorably weird, which makes this book well worth a read by any fan of fantasy literature. Shea may be no Vance but he nevertheless offers more of interest than many more well known fantasy authors, particularly if your tastes tend toward the dark and outré. I've never read this, but heard of it off and on for years; I'll have a look for it. "...but was actually granted status as an authorized sequel by Jack Vance itself." The sequel to Nifft, The Mines of Behemoth, is less interesting, less visionary, more straightforward in its adventure -- but it's an interesting travelogue through the demon realms, with some ecological touches that would be easily adaptable to an FRPG setting. Shea may be no Vance, but then who is? "The Fishing of the Demon Sea" features what no less a commentator than Algis Budrys calls "the best entry into Hell in all of literature" (I won't spoil the ride for those who've yet to read it). Nifft and Barnar's exploits have a very D&D flavour. Wealth is their motivation, and they're not afraid to get their hands dirty in the procuring of it. I've long thought (though I've never done anything about it) that the world of Nifft would make a fantastic alternate setting for the Stormbringer RPG. There's just something about Shea's infernal imagination and the unpredictable savagery of BRP combat that meshes in my mind. Does the scene on the cover resemble any scenes in the book? The trouble is, I can't help but compare Shea/Nifft with Vance/Cugel. Were I not aware of the connection, I might have been able to appriciate Shea on his own merits. My recollection differs from James. I'm on vacation and don't have the book handy but I thought the cover is a pretty direct portrayal of two of the denizens nifft meets in the first story? Btw, NTL is one of my all time favorite S&S books. May I be permitted to mention a couple of other novels by Shea that might be of interest to gamers. The Colour out of Time does quite a neat job of updating Lovecraft without aping the Old Gent's style at all, and In Yana, the Touch of Undying is not only a splendid title but also an entertainingly twisted tale about an overweight mage. It's full of weird/fun monsters and even features an inspired megadungeon. @ James I'd love to see your thoughts on Quest for Simbilis if you ever review it. Your blog was what got me into a heavy Vance kick in the last couple of years. I'd love to see your thoughts on Quest for Simbilis if you ever review it. Your blog was what got me into a heavy Vance kick in the last couple of years. When I find a copy, I'll be sure to do a post about it. Open Friday: Hobbyist vs. Professional? The Articles of Dragon: "Falling Damage"
The Articles of Dragon: "Charting the Classes"
The Articles of Dragon: "The Astral Plane"
The Articles of Dragon "The Assassin's Guild"